Horizontal screens can be both esthetically pleasing and separate you from neighbours. Vintage lights bring a touch of the indoors outside. 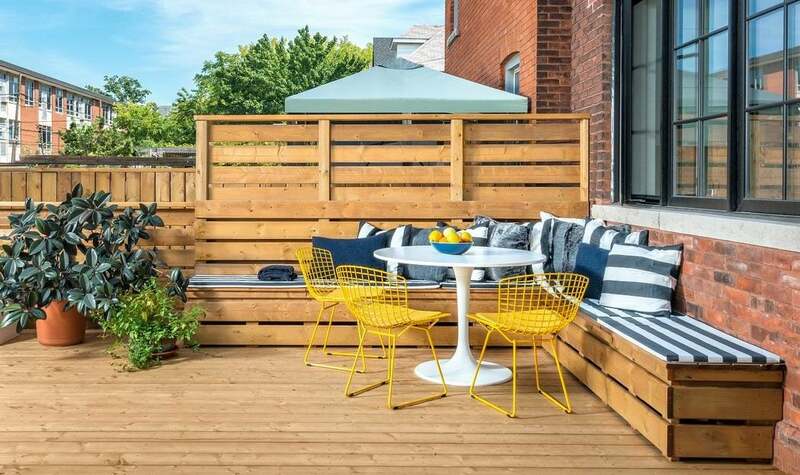 Creating backyard privacy that’s also stylish doesn’t have to be difficult. 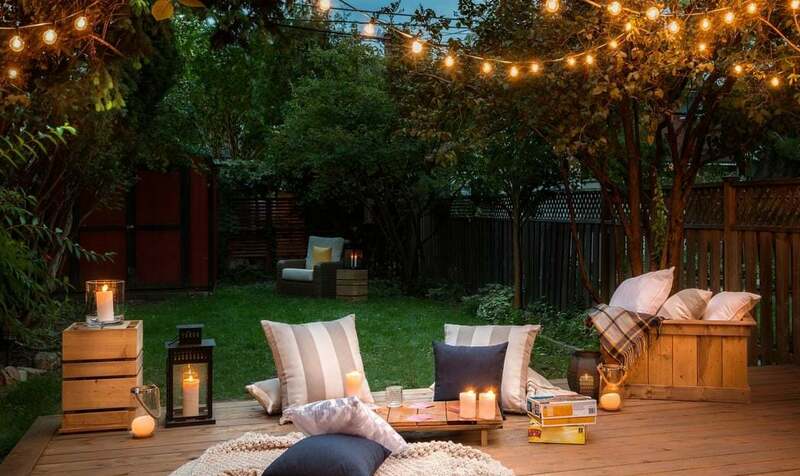 Everyone wants their backyard to be their own slice of outdoor heaven. Whether you’re blessed with enough space for a ball game or if all you have to work with is a condo balcony, as our cities become more and more crowded, creating a private spot to relax in is a priority. 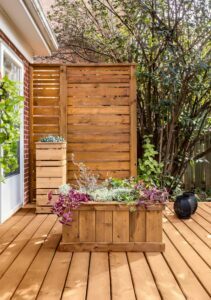 For both a large or small budget, the trick is to get creative with your existing surroundings to provide a natural esthetic that creates privacy. Greenery, trees and bushes can add both privacy and shade. Plants: Adding low-maintenance greenery can optimize privacy and create visual appeal. Tall grass planted in raised planters, for example, makes for a nice blind while allowing the wind to pass through easily. If greenery isn’t enough, consider fast-growing trees that will work with your location and can offer both privacy and shade. For more immediate shade (and sometimes privacy), a canopy can mount to three stationary points to create a great UV blocker. Pergola: Overhead privacy structures and pergolas provide endless possibilities to add style, privacy and shade to your backyard. They’re a great outdoor investment that also increases the value of your property much like a deck would. And they create the sense of an outdoor room, framing the space and making it more inviting since it gives you a little more privacy. To add personality, plant climbing vines to gradually colonize the structure for a natural, soothing canopy. And try trailing fashionable vintage lights or lanterns to bring a touch of the indoors outside. Horizontal privacy: Horizontal or woven privacy screens are a great esthetic addition that can help create that separation from neighbours. They also provide seclusion and a cool lounge feel to any outdoor space. 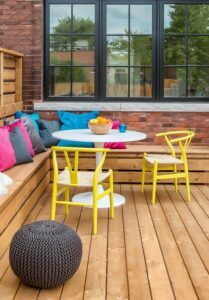 Add bright tones to make your outdoor space feeling welcoming. Upcycling: I’m a big fan of transforming unwanted old furniture or doors into unique outdoor accents. You can easily make over a vintage door into a privacy wall to add a personal and vintage touch. It’s a fun and affordable project that also reduces our carbon footprint. Furniture and accessories: Brighten up shady corners with vivid jewel tones, shades and vibrant patterns. If your backyard feels like you’re on vacation, then every time you step outside will be as invigorating as a holiday. Feel refreshed with sunshine yellow bistro chairs, bright blue accessories and modern white tables to entertain your family and friends … behind colourful and multi-tasking privacy curtains, of course. For more outdoor project inspiration and DIY how-tos, check out handcraftedbychrispalmer.com and microprosienna.com. Chris Palmer has quickly become a household name through his thoughtful and creative DIYs. With a strong focus on handcrafted woodwork, Chris has turned his passion into a career – creating custom projects through his company, Handcrafted by Chris Palmer. 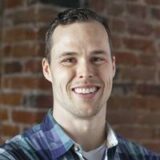 He made his national debut on the hit HGTV show Canada’s Handyman Challenge, and is now a regular guest expert on the Global Morning Show in Toronto.